An Ornithopter, or ornitotero like Leonardo da Vinci termed them, is an aircraft heavier than air, which flies like a bird by flapping its wings. The special feature lies in the wings that do not only generate lift but also thrust. Ornithopters are mostly built the size of birds or flying models and then are also called flapping wing model . The basic operating principle of a flapping wing has already been discovered (1889) by Otto Lilienthal . To help understanding an effective way of flying of big ornithopters his functional description is still trend-setting to the present day. Especially Alexander Lippisch (papers 1925 - 1939) and Erich von Holst (papers 1940 - 1943), as well as the research work of many biologists, have advanced the theory of the flapping flight further. But many details are still not understood. Always there have been several different versions of the flapping flight theory. They all exist in parallel and their specifications are widely distributed. Calculating the balance of forces even of a straight and merely slowly flapping wing remained difficult to the present day. In general, it is only possible in a simplified way. Furthermore, the known drive mechanism and especially wing designs leave a lot to be desired. In every respect ornithopters are still standing at the beginning of their design development. But powerful drives make very beautiful flights already possible. Also here follows only a variant of the flapping flight theory in short version. On a stretched flapping wing lift is generated similar to an inflexible airfoil flown against from the front. But during the wing upstroke the air flow hits the wing rather from above and in the downstroke rather from bottom. These modifications are small in the area of the wing root and gets bigger towards the wing tip. With permanent changing twisting the flapping wing must adapt to these alternating incoming flow directions. Here, however, the lift distribution along the wing span must not be kept constant in the interest of generating thrust (please look at the diagrams). During the wing downstroke the lift distribution is bigger altogether than when gliding and more displaced towards the wing tip. It is easy to imagine that thrust is generated along the whole wing span during stroke motion. This works similar to a propeller blade with a very large pitch - only that the propeller torque force that has to be overcome is here called lift and is also used like that. On the wing upstroke circumstances are reversed. Overall, the lift distribution is smaller and more shifted towards the wing root. With the stroke motion in the direction of the lift force the flapping wing now acts as a wind turbine blade. If the lift force is big enough it presses the wing upward even without a mechanical drive. Thereby, the wing operates with the operating drag or working drag, of a wind turbine against the flight direction (please takes a look at the vector diagram). At the same time, the outboard wing areas are flown against rather from above. There indeed is generated negative lift but similar to a propeller also thrust (please look at the vector diagram). Whether in the upstroke the wind turbine or the propeller function dominates depends on the wing twisting and on the shape of the lift distribution (for more details, please see following chapter). The adjacent picture clarifies that the comparison does not apply in all respects to a propeller or to a wind turbine. The velocity proportions at the flapping wing are completely different. But the rotating machines are not designed for simultaneous lift generation. Furthermore, at the flapping wing the lift force at mid-span of the wing is never zero - as like at the rotating machines. A flapping wing is an aerodynamic machine with two working cycles, the upstroke and the downstroke. In unaccelerated horizontal flight of a flying wing ornithopter the degree of efficiency of this machine is equal to zero. It only moves itself but emits no power. But if you add a fuselage and a tail unit to the flying wing ornithopter, the flapping wing must apply power to overcome the parasitic drag. Now the flapping wing renders output. Now, paradoxically - with an otherwise unchanged flight attitude - the efficiency factor becomes bigger than before (bigger than zero). For example the efficiency factor of the flapping wing increases with the size of the tail unit while keeping the balance of forces. So the parameter efficiency factor is relatively inapplicable for evaluating flapping wings (please take a look at the comparison of the transport performance). The total thrust gets bigger the more the lift distributions of the up- and downstroke are different from each other - especially at the outboard wing area where the most working will be performed. If the difference equals zero operating drag and thrust have the same size and cancel out each other (please look at A. Lippisch 1938 and the vector diagram). The total thrust equals zero, then. At an existing lift difference the thrust is also increased with increasing flapping frequency and flapping amplitude. For a steady flight, all forces - more precisely the force impulses (product from force and duration of action) - affecting the ornithopter during a complete wing beat cycle must be in balance. The propeller effect must not only balance the wind turbine effect but also all remaining drags of the wing and the aircraft. At the same time, the positive part of the lift must outbalance the negative to an extent, that it can carry the weight of the aircraft. The course of the lift along the span is modified by the twisting of the flapping wing. But also a rotation of the wing as a whole around its longitudinal axis changes the lift. This rotation of the flapping wing is determined by a rotation of the wing root. The rotation of the wing only affects the size of its lift, but not its distribution along the span (see adjacent figure). The rotation of the wing root is indicated starting from the glide position and determined here only indirectly by the selection of the lift size. For this purpose, the circulation factor kΓ is used in the calculation tools (the cirkulation factor k-Gamma describes the size of the lift in relation to that of the gliding flight). In the adjacent picture, the lift with rotation of the wing root during upstroke by about +6 degrees, amounts to almost 80 % of the gliding flight. When rotating the wing, the required twisting becomes considerably smaller. However the rotation is limited by the maximum permissible lift coefficient of the airfoil at the wing root. The rotation and thus the lift can be further increased by greater camber of the airfoil and/or wing depth in this area. Birds in particular use a very large camber of the airfoil. In the generally used theory of the cruise flight of birds the rotation of the wing is not considered. Also with the older lift distributions shown above, the angle of incidence at the wing root is kept constant during the wing flapping motion (please see diagrams 1 and 2 above). 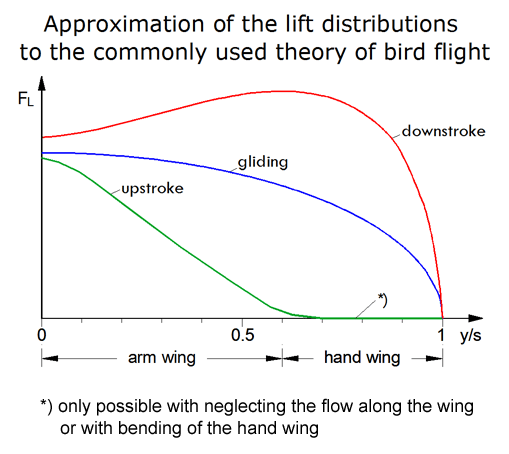 The pictured differences of lift at the wing root results only from different induced downwind angles (please look at the diagram Downwash distributions). The propulsion is mainly generated by the hand wing, but about 40 % also by the arm wing. When rotating the wing root (here about +6 degrees), the negative thrust remains relatively small, despite almost the same lift as in gliding flight (here approximately 80 %). To equalize the total lift, E. v. Holst (1943) suggests a rotation of the wing root, in addition to wing twisting. Based on present knowledge, however, turning should not be done at up- and down-stroke like at my flapping wing models EV1 to EV5, but only at upstroke. For birds in cruising flight the rotation is sometimes good to observe, especially near the lower final stroke position (see animations of a swan and a stork and the article Lift during wing upstroke, version 10.0, 2015 - 2018, PDF 1.0 MB). The thereby resulting large lift generates, so to speak, a large impulse of lift as reserve capacity. Then, the bird does not need to generate so much lift during the subsequent rapid upward motion of its wings. In this way, the wind turbine function and the resulting negative thrust of the upstroke become smaller. Nevertheless, the sum of the lift impulse will be large over the entire duration of the upstroke. Increase the angle of attack by rotation of the wing in the close-range of the lower final stroke position. Shift as much lift as possible to the span centre during the fast upstroke motion. By twisting and rotating of wing, however, this is only partly possible. The thereby reduced but still occurring negative thrust must be taken into account. Maintain the large angle of attack at the elbow in the upper final stroke position, until the hand wing is extended (see the motion sequence of the arm wing at the articulated flapping wing). This also works without rotation of the wing. In connection with the increase of lift near the wing root, it may also be that birds use even more possibilities. They may be able to increase the angle of attack and/or the airfoil camber in the elbow area in conjunction with the angle of the wing during wing upstroke or with the tension muscle of the anterior pelvis. Also in this way the lift will rise near the wing root. Especially with not so high demands on the lift changes, thereby can be dispensed with the rotation of the wing root. For further information about the rotation of the flapping wing see chapter 4. How birds fly. Very thorough observations of the bird flight and interesting ideas of the wing upstroke and the wing rotation also shows Brendan Body`s homepage, external link 1. At the wing upstroke the aerodynamic forces along the wing can be adjusted by suitable wing twisting so that the torsional moments round the wing hinge balanced themself (please look at the following diagram 3). Here, the wing area close to the fuselage acting as a wind turbine directly powers the outboard wing area acting as a propeller. This is the 1st possibility to use the wind turbine energy. There is no energy consumption or transfer at this upstroke configuration. The wing can virtually be flapped up by the drive without effort. Propeller and wind turbine effects cancel out each other. The overall effect of the upstroke in the thrust direction is thus equal to zero. A special lift distribution at the upstroke when the stroke momentum of the inner and outer wing section balanced each other exactly. Thus, the wing can be moved upwards without an external force. Due to the lever action of the wing at this upstroke setting the positive lift close to the fuselage must be bigger than the negative lift at the wing tip. 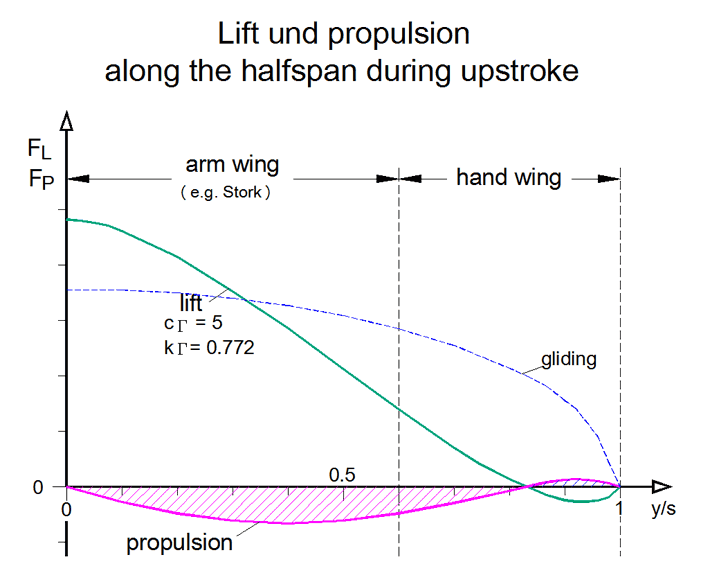 In total, there still remains some positive upstroke lift ( Otto Lilienthal 1889). 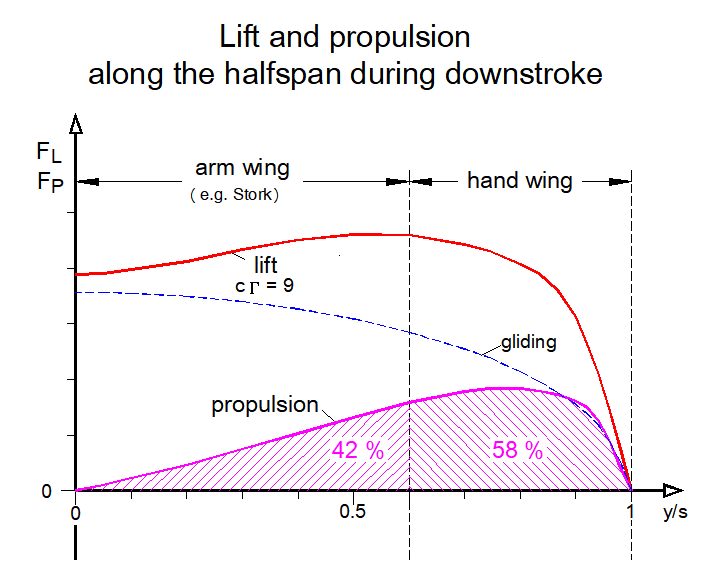 The wing downstroke with its generally strong generation of lift and thrust can ensure the balance of the remaining forces during the whole flapping cycle. Would one do without lift in favour of thrust generation in the upstroke the following should be considered. To generate the complete lift-pulse only in the downstroke - in virtually half of the available time - the lift force and consequently the wing area, too, would have to be almost doubled. This and the corresponding lift fluctuations are only appropriate in exceptions. As to be seen in the diagram 1 shown lift distributions the average lift of both working cycles are different in size. At least at low flapping frequency, this will result in an obvious pendulous motion of the fuselage. But due to thereby generated variations of the angle of incidence it deadens itself quite effectively. These variations are not included in the diagrams. Naturally, other settings are possible in the area close to the preceding lift distribution. They are well suited for gently inclined climb flights with a moderate flapping frequency. My EV-ornithopters have been built for this way of flying. Starting from the previously described flight scenario for the horizontal cruising flight it is more advantageous to increase the total lift during the upstroke and shift it a little more towards the wing tip. There, only a little bit of negative lift is generated - if any at all (please look at the force vectors of the following picture). But by this way, the wind turbine effect and its operating drag are increased. That this should be beneficial is amazing at first. The wind turbine effect now can no longer be used for generating thrust in the area of the wing tip. Would it not be better simply to increase the flapping frequency? According to a proposal by Otto Lilienthal the wind turbine or the wing upstroke energy may also be used again in a 2nd possibility. At first, the operating drag slows down the flying ornithopter. Thereby detracted kinetic energy of the model can be accumulated in a spring. This spring must be positioned in a fashion that it is tensioned at the upstroke. It relaxes in the downstroke, supports thereby the flapping motion, generates thrust and transfers wing upstroke energy back to the kinetic energy of the model. A 3rd possibility for using the wind turbine force lies in the acceleration of the wing mass in upstroke direction. If the wings are then slowed down at the upper final wing position by a spring and accelerated in downstroke direction, retransfer of the upstroke energy is also affected in this way. Thereby, the acceleration of the wing must not be limited to the initial stage of the upstroke. In the upstroke, a mechanical drive of the flapping wing is not necessary in these cases. The wing even releases energy to the above-mentioned springs. Anyway, the wind turbine motion must act against any force. Otherwise no lift can be developed on a freely movable wing. The energy emitted during wing upstroke is normally relatively small. This is especially true when the lift is concentrated in the middle of the wing span. A good way to decrease the wind turbine effect in spite of strong lift generation is the pulling or the dragging of the outboard wing section during the upstroke of the inboard wing section. Thereby the outboard section of the wing becomes an end plate or a winglet to the inboard section of the wing. This mainly has a bisecting effect on the effective wind turbine span. At the same time, it reduces with its winglet effect the induced drag of the inboard wing section. Furthermore, it reduces problems of wing inertia, particularly in the area of the upper final wing position. To enable at the upstroke strong lift at the inboard wing section it will be equipped with large airfoil camber. Close to the water surface a Mute Swan during cruising flight. The downstroke twisting is negligibly low. Thus sufficient lift can also be generated during upstroke here the angle of attack is increased near the wing root. This already starts before the end of downstroke, reaches the maximum near the lower stroke end position and ends approximately at the middle of the wing upstroke. 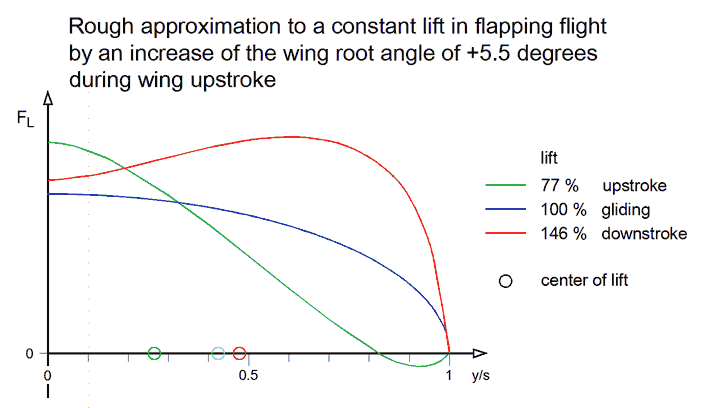 The changing of the angle of attack near the wing root is a characteristic of the flapping flight of birds. It increases the shifting of lift distribution along the semi-span, but is not always as pronounced as in this flight situation (after starting obviously the full cruising speed is not yet reached here). Due to the extended shifting of the lift distribution toward the wing root also increases the area of the slipstream (blast of air) or the thrust. More details about this you can find in the Handbook, annexe E (in German) and in the article Arrangements of wing tip vortices on flapping wings (PDF 0.5 MB). In the upstroke increase and decrease of the angle of incidence move like a wave from the wing root to wing tip. During upstroke, the relative strong turning of wing decreases. This may give the wrong impression from the viewing direction that the wing twisting changes the direction during the upstroke. Due to the pressure difference on the upper and lower side of inboard wing section the turnable outboard wing section intends to stroke up. But it is probably prevented by the negative lift at the wing tip section. The leading inboard wing section stoped at the upper position until the outboard wing section reached the top of its stroke. After the outboard wing section was pulled up hanging on its wrist, also its turning in the upper stroke position occurs only with the lift. The picture series has been presented to me by A. Piskorsch privately. The flapping wing as an aerodynamic two-stroke machine constantly generates positive lift. In the direction of flight, however, it works with its thrust times forward (downstroke) and sometimes backward (upstroke). Nevertheless, together with the three possibilities mentioned above, the whole entire drive energy is used to generate thrust forward. Of course there are the usual losses due to the profile drag and the induced drag. However, this is always the case for the generation of lift. In spite of changing acceleration direction, flight velocity should be kept constant. Thereby are definitely advantageous a high stroke frequency and a large model mass. During such cruising flight configurations of the upstroke, its lift increase more than during the gently inclined flight. Apart from thrust generation also lift generation during downstroke can be released. Therefore, its lift distribution will be shifted rather towards the wing root and concurrently be adjusted smaller. Distributions of lift for a cruising flight with unlimited wingspan. Also the distribution of the upstroke is optimized in relation to the induced drag. Altogether, in cruising flight the lift distri­butions of both of the work cycles have been approximated to those of gliding. One approxi­mates them the more flow-favourable the aircraft is built. Less thrust is then necessary. Furthermore, the induced drag of the downstroke decreases noticeably this way. Perhaps it might be enough to shift the lift only a little along the span, without changing its size - in the upstroke towards the wing root, in the downstroke towards the wing tip. However, a twisting of the wing root is necessary for that. During the whole downstroke and at the beginning of the upstroke the angle of attack is increased in the center of the semi-span. The advantages of the flapping wing working in opposite directions during wing up- and downstroke lies especially in the relative even lift generation. The perpendicular motion of the fuselage disappears almost completely in horizontal flight. Altogether, a very effective steady cruising flight can be achieved with thrust only directed forward and not upward. Thereby, the flapping frequency is obviously lower than during the following way of flying. Precedingly, flight situations are described during which lift is directed upward and thrust forward. The all up weight is thereby carried by the wing lift. In short, this can be called Flying with lift . But similar to a helicopter, during flapping flight the weight force can be balanced by a slipstream directed downward or by a thrust force directed upward. This is Flying with thrust . Thereby, the wing upstroke practically affected only with the drive. At least in steady flight, the thrust force is always perpendicular to the wing-stroke plane and can be adjusted according to their inclination. If the thrust force points exactly in flight direction, there is either pure flying with thrust (perpendicular climb flight) or pure flying with lift (horizontal flight). In settings between these extremes and during a horizontal motion not too slow, the balance of all up weight is affected both by thrust and by lift directly generated at the wing. These mixed configurations are also assigned to flying with thrust. The taking off of an ornithopter, hovering on the spot, strong inclined climbing flight and slow horizontal flight are only possible according to the method flying with thrust. In contrast, moderate fast horizontal flights can be conducted with both ways of flying - with quite a different demand for power, though. Relatively fast horizontal flights or cruising flight can be achieved only by flying with lift. In flight praxis, especially the inclination of the stroke plane acts as identification criteria for ways of flying. In horizontal flight it is vertical to the flight direction. If it differs considerably (more than about 10 degrees) it is flying with thrust. Furthermore, a big upstroke wing twisting in a passive wing twisting is an indication for this way of flying - at least at high Reynolds numbers. Also, a relatively high power consumption relating to the horizontal velocity points to a flying with thrust. Furthermore, the legs of birds, at least of the larger ones, are not fully stretched backwards when flying with thrust and their body still is not fully directed in flight direction ( R. Demoll 1930). But in publications of bird flight research it is only rarely pointed out to these both unequal ways of horizontal flight. The high power consumption during slow flight is commonly only ascribed to the thereby increasing induced drag (for an example please look at external link 2). Flying with thrust can be carried out in technical model making since the beginnings of aviation. But in horizontal flight of large and weightily ornithopters this way of flying demands considerably more energy than flying only with lift. Otto Lilienthal had already distinguished clearly between these two ways of powered flying among birds and has pointed out the enormous flight energy during slow flight. Also birds apply the displacement of lift along the wing for propulsion or thrust generation. Erich v. Holst has illustrated it very clearly in the following scheme. In it, the location of the center of the lift distribution is represented by a wing section which is shiftable along the wing semi-span. At the upper reversal point of the stroke motion it is shifted towards the wing tip and at the bottom point to the wing root. In this way, seen over a whole flapping period, while maintaining the normal force Q (or the lift) the thrust S gets larger than the backward directed force R.
With this ingenious trick of nature, it is possible to generate much lift also during the upstroke and nevertheless, seen over an entire stroke cycle, a thrust generation is made possible. Because birds are shaped aerodynamically efficient it requires for them only a relatively small shifting of lift for the cruise flight (see, for example the position of the centers of pressure in diagram 4, above). Other than in small birds, here, the primary feathers are splayed during up- and downstroke. The nodding motion of the bird's body causes an increase in the angle of attack on the wing root, especially at the beginning of the wing upstroke. The physics of bird's flight, which is commonly used today, is based on an other idea. In it, in particular the arm wing is intended to generate lift during the up and downstroke. The thrust generated there during the downstroke is compensated by the back drive, generated there during the upstroke. Lift and thrust generation during a flapping period according to descriptions of the bird's flight with strong fluctuating lift. Supposedly approximate course of the lift distributions along the span according to the vague descriptions of the cruising flight of birds. In the hand wing, a lot of thrust is been generated during the downstroke. During the upstroke, the hand wing is then guided upwards without any significant force, thus only with the remaining profile drag. It is said, that in this way the lift of the bird is mainly generated in the arm wing and the thrust in the hand wing. The large lift in the hand wing, which is necessary for generation of the large thrust during downstroke, is neglected in such a discription. Sometimes, however, it is also said that during the downstroke the most lift arises (see the adjacent diagrams). 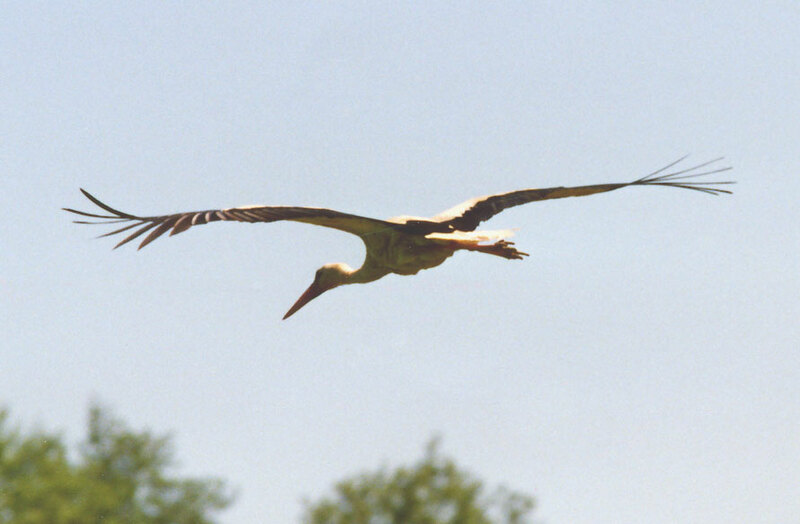 About a rotation of the wing root during cruising flight of large birds, or other measures to increase lift during wing upstroke, is nothing reported. Thus, the lift changes considerably, seen over a whole flapping period. 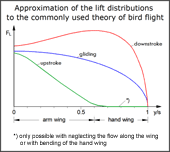 Also in descriptions of the flight of birds the function of the wing downstroke is compared to a propeller. A corresponding analogy from wing upstroke with lift, with its well-known additional drag, cannot be found. The function as a wind turbine and its possibilities for using are obviously unknown. The physical cause of the additional drag, it's thrust against the flight direction, therefore remains in the dark. Also Otto Lilienthal and E. v. Holst mention this context only casually. Both bird flight theories, i.e. the common theory with strongly variable lift, and those with the shift of approximately constant lift, according to Erich von Holst, are in principle not so far apart. Both methods work with the displacement of lift - however with the birds it's not referred to as such. In both cases, the wing on upstroke can move upwards without drive, so only with the lift force. Professor Jeremy Rayner has researched the flight of birds at the University of Leeds (England) and also already largely described the flight of birds with constant circulation (see article Vertebrate flapping flight mechanics and aerodynamics and the Evolution of flight in bats in Nachtigall W. 1986, BIONA-report 5). He emphasizes the importance of this gait and sees its strong experimental confirmation in the flow visualization experiments with a cestrel in fast flight by G. R. Speeding (1982, The vortex wake of birds: an experimental investigation, Ph.D. Thesis, University of Bristol, U.K.). They show a non-planar pair of vortices with variable span, closely following the wings and missing approach vortices (please look at external link 3 and the Arrangements of wing tip vortices on flapping wings , PDF 0.5 MB). For ornithopters it is easier to realize the method with strong fluctuating lift, as described in the commonly used physics of bird's flight. In this case you need no rotation of the wing root. However, you have to forgo the advantages of an at least almost constant lift (please see Lift during wing upstroke, version 10.0 , 2015 - 2018, PDF 0.9 MB). A further clarification of the different theories of bird flight is possible in particular by measurements in the wind tunnel. Thereby the effects of various twists and rotations on the lift distributions along the span should to be measured on technical flapping wings. Further optimizations are possible by investigations on flapping wings with different contours as well as with and without bending of the hand wing. Also the behaviour of the tip vortices during twisting and rotation of the flapping wing is very informative. according to the theory of bird's flight. Vertically upwards or in flight direction acting components of the resulting force build lift and thrust (Please look at the diagram: Configuration of the forces). In the upper and lower final wing position for a short time these forces have similar sizes to those of gliding flight. Up and down movements of the fuselage due to changing lift has been disregarded. Further details of the flapping wing theory and a calculation method that uses quasi-steady aerodynamics and blade element theory, which has already been used for flapping wings by Otto Lilienthal, can be found in the Handbook. Also look at the reference list of this commentary.